In my previous blog we enabled the project for adf security. Now is time to see it in action. 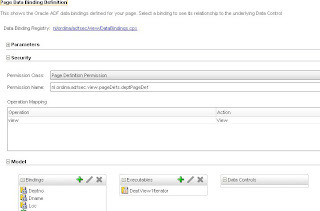 I will show how you can add security to a page and to specific button actions. I use in this example the system-jazn-data.xml of the embedded oc4j. You can edit this from the menu tools / embedded oc4j server preferences. First we make a region with security info so we can see on every page what the security settings are. This region also contains a login and logout button. In this example I have two pages , the first page start.jspx doesn't have any security so adf security uses the anomynous account. 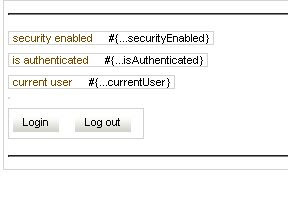 the second page have security on the page , you need to have the role users to see this page and the navigation buttons are enabled if the user belows to the oc4j-administrators role. Now let see how we can add page security to a page. To view this page you need to have view right. We can do this by opening the pagedef. the next step is to add the view rights to the roles users and oc4j-administrators. 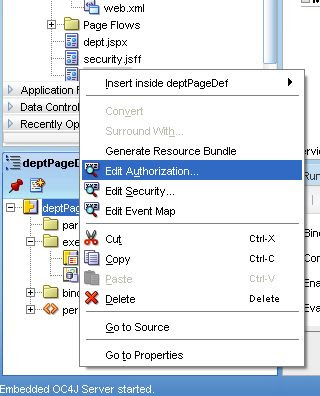 We now go the pagedef structure window and select the pagedef node and with the right button we open the authorization window. These security entries are put in system-jazn-data.xml and jazn use the pagedef name as unique entry so make sure you don't have the same pagedef twice on the production server else both pages has the same security. You can do this also for the binding actions like next, first etc. Now we make sure that you need to have oc4j-administrator role to press next etc. and we ready to test it. ADF Security implementation can be viewed as an extension to the standard J2EE container security and is executed after the standard security constraints have been processed. 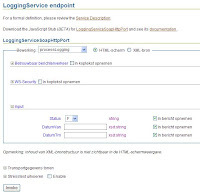 It is integrated in ADF of jdeveloper 11g and is implemented dynamically. This gives us many advantages such as changes in roles are immediately active and you can have different permissions in one page. For example in the pagedef you can add rights to roles on specific attributes, pages and methods. In your applications, you can also use Expression Language (EL) to show or hide items on a page based on a user's permissions, which are defined in the run time policy store. 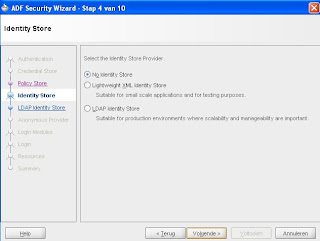 If you use adf security in your application and you also selected anonymous access in the adf wizard then you automatically are logged in as anonymous if this page does not have security and if you go to a page where there is no anonymous security defined then you get a login window or you can start the following url /project-context/adfAuthentication to get the login windows. 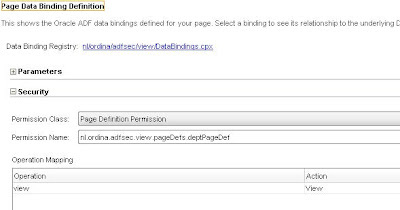 Here you define in the pagedef of the page that to see the page you have to have the view permission. Make sure if you run on windows xp that you start jdeveloper in single user mode ( jdeveloper -singleuser) else the jazn editor in the embedded oc4j does nothing. 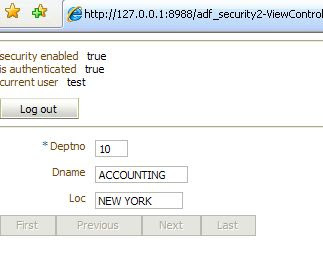 In the next adf security blog I will demostrate the different security options in a page. I discovered that the jazn configuration (Identity Store) in 11g tp2 of the embedded oc4j didn't work, so I googled a bit and saw the solution of Steve Muench. It seems that jdeveloper 11g is started by default in multiuser mode. That's why it creates a jdeveloper directory with the embedded oc4j in your user folder. The jazn error is caused by a space in the folder name of the user. On windows xp you have your user data in this folder C:\Documents and Settings\ebi15170. You can solve this by starting jdeveloper with the -singleuser option or set the JDEV_USER_DIR environment variable to a folder name with no spaces. Steve Muench hold a jdeveloper 11g page with more tip so check this out. 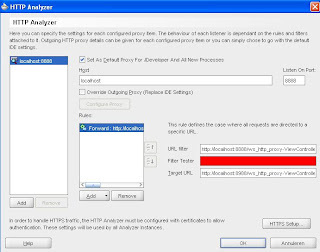 The http analyzer is not new in jdeveloper but in 11g Oracle added some new features. You can define now rules in the http analyzer. With these rules you can emulate ws and change your environment. The following rules are supported Tape, URL Substitution, Pass Through and Forward, I will explain these rules later in this blog. 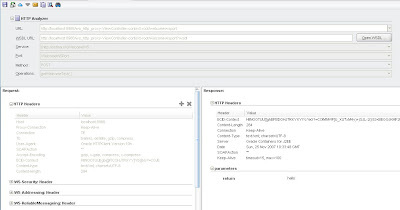 You can save and load the web services requests and responses in a ws-i log file, test a web service in the http analyzer in the same way as in the oc4j server and it supports https. The first rule is forward. Forward does the same as in 10.1.3 , it passes the message on to the real web service. In the url filter you can set the incoming url of the web service and in the target url you can set the real url of the web service. Filter tester is to test the url filter with the calling url. This can be handy because in the url filter you can define wildcards. 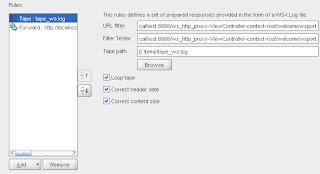 With the tape rule you can test the ws client without the need of the webservice. first you have to save the entries in a ws-i log file then you can use this file to respond to the ws client calls. The url filter and filter tester are the same as forward rule. The tape path is the ws-i log file of the saved entries. The tape rule can correct the time and size of the entries in the ws-i log file so the returning message to the ws client is valid. Loop tape is necessary if you want to retry the ws client. The last two rules are url substitution pass through rule. The first you can use if you want to change the url or parts of this url because you deployed it to an oc4j container in stead of the embedded oc4j of jdeveloper. the pass through rule does nothing if it matches the url filter. Conclusion, you can use the analyzer perfectly for your test environment because with the tape rule you don't need all the web services to test your ws client and if there is a change in your ws environment you can use the other rules to fix it or let is pass. The jmx datacontrol is a new feature of adf. This datacontrol is an interface between the jmx servers and adf. Now you can make a gui on the mbean attributes and operations. In jdeveloper technical 2 preview you can only make a jmx datacontrol. You can't configure it, you have to do it manually but there is no information how to do that. But if you look at the dc-adapters.jar ( this is the datacontrols jar ) You can open the jmx schema. 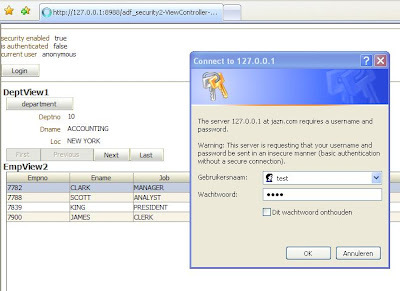 Here we see dat de jmx datacontrol allows you to connect to mbeans servers and give a interface to the attributes and operations of this mbean server. This datacontrol makes it possible to make a frontend on the mbeans in your own applications. In 10.1.3 you had to go to em website. I think this gives jmx a boost in jdeveloper 11g applications. In this example I have a Yahoo maps page where the markers on the maps comes from a csv file which contains our companu offices and it is enriched by a rest web service to get the longitude and latitude coordinates of these locations. The csv and rest webservice are adf url datacontrols. In this example I only have to make a pagedef with the operations and iterators on these datacontrols. The next step is backing bean for calling the operations and collecting the data for the yahoo maps page. Here is the result. 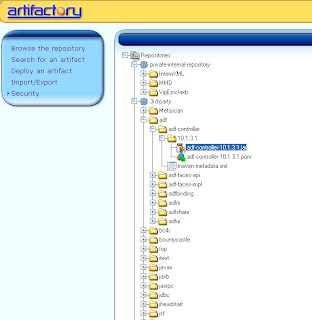 Let's look how we create the adf url datacontrols. 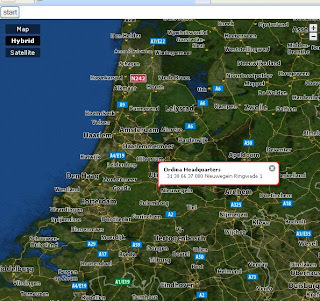 For the coordinates I use a web service from geonames. I can call an url with parameters in a normal browser and it gives me a result xml. You need to have a web server to put the csv on. You can use the embedded oc4j for this. when you create a page and drag the csv method from the datacontrol as parameter form and the result as read only table, then the result can look like this. If everything works fine then we are ready to make the maps page and his pagedef. We create the page and then go to the pagedef . Here we put in the methodIterator and the accessorIterator of the two other demo pages. We copy the two methodActions too and we add two table bindings on these method and acessoriterators. Create the bean and add the bean definition in the afdc-config. In this bean we put in a method which gathers the required data for the markers on the yahoo maps page. We are ready to test it. 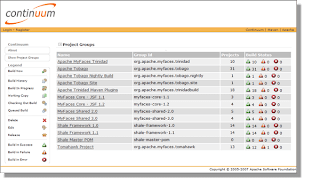 This is a jdeveloper 11g technical preview 2 example and this project has some problems to execute the geonames webservice twice in a loop. The oc4j container support jmx, with this you can use mbeans to check the status of processes change application variables or you can start or stop background processes. 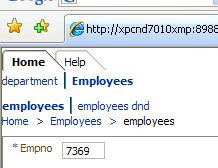 You don't need to make a custom page with buttons to see the mbeans you can do this in the enterprise manager website. 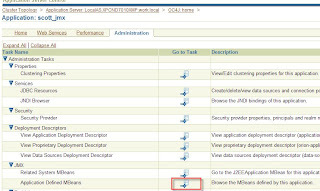 If you deploy the ear then you have in the administration page of the deployed application a link to the mbeans. Here you see the bean. In JDeveloper 11g you can re-use taskflow in two ways . Make an adf library or deploy the application to an oc4j 11g container and use a taskflow call with this remote url. This can be very usefull if you have many applications in your company with the same components like login flow etc. You can also use it if you have a central customer hub and want to maintain this customers from different applications and don't want to make this functionality twice. 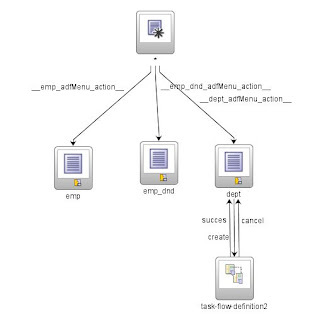 First I made an adf taskflow project with an bounded login taskflow. This login flow does not nothing. 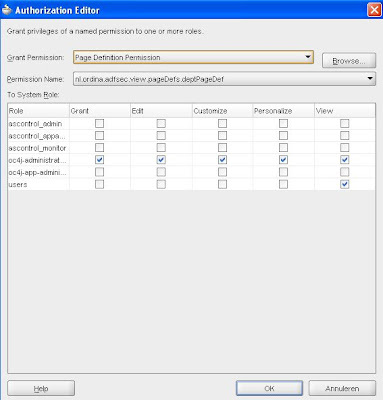 I de-select the create with page fragment. 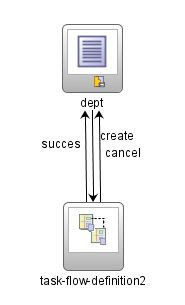 This taskflow has two view , the default view is a login and the other is a new user page and a wildcard control flow rule so I can call the succes and abort return activity from both views. 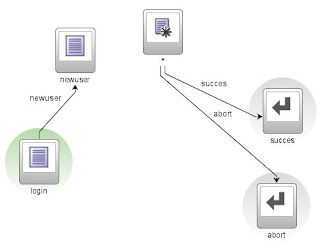 Let's create the login and new user page and put in some adf command buttons with the succes,newuser and abort action. Now we are ready to deploy this to an adf library and to an oc4j container. Make in this project first a adf library jar deployment and generate this jar. Now you can use this login flow in other projects. 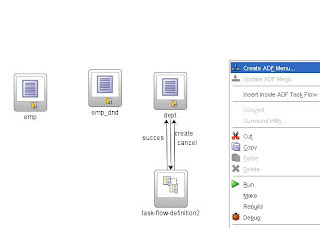 Open an other adf taskflow project and add the generated login flow jar to this project. 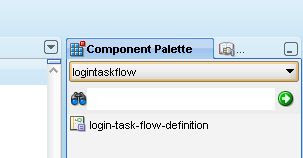 If you open the adfc-config.xml you see in the component Paletten the login flow. Now you can use this page flow. The only down site is that the pages like new user and login in this login flow can not be used. When you run it it tries to look for the pages in the current webapp and not in the jar. You can use this option perfectly for your own taskflow templates library. Let's re-open the login flow project and create a war deployment so we can deploy this webapp to an oc4j 11g container. I use the oc4j container from jdeveloper 11g and put in some enviroment variables to the bin\oc4j.cmd file. We can start the container with bin\oc4j .cmd -start. Make in jdeveloper an application connection to this standalone oc4j and deploy to this application server. 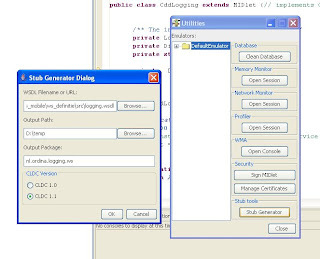 We go to the other project and open the adfc-config.xml and drop a task flow call to this diagram with three control flow cases the first is login to call the login flow and put in a commandbutton with this action , succes then we go back to emp and abort then we go the other page so we can see that abort and succes works. 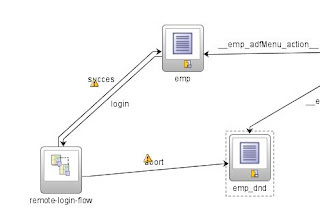 The last step is to configure the login task flow call. The remote url is http://localhost:8888/login-ViewController-context-root/faces/adf.task-flow? This is the login webapp url. You can use a backing bean for this so you can use an another url for production. without making more versions. 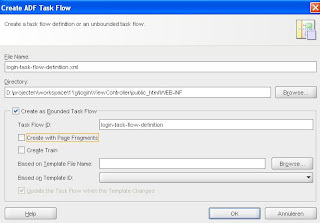 The id is the login task flow id and the last is the login taskflow xml filename /WEB-INF/login-taskflow-definition.xml. We are ready to start the new application. In this case I work topdown because I want to know that j2me can generate java code from the wdsl/ xsd files . So I first designed the xsd's and wsdl with altova xmlspy. You can do this with jdeveloper too. Now we are ready to download the j2me toolkit. I have to use j2me toolkit 2.2 for my nokia n95, check your mobile operating system for the right supported version of j2me. Installed it and run utilities in the j2me wireless toolkit 2.2 menu. Next we start the stub generator. Here I discovered that is JAX-RPC Standard Implementation of j2me doesn't support date schema elements. So I had to change the date elements to string. Now we can download eclipse and eclipseme. Eclipseme is an Eclipse plugin to help develop J2ME MIDlets. 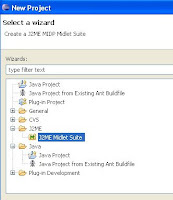 Now we can start eclipse and make a new midlet project , the next step is to import j2me toolkit 2.2 so you can select mediacontrolskin.We can import the generated web service client code in this midlet project. Now we can build a jdeveloper web service from the wsdl. 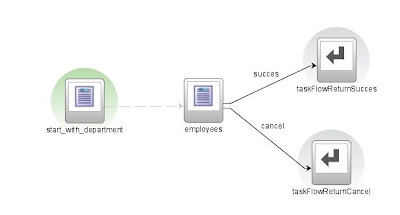 We first create a new project and generate java web service from wsdl and toplink to get the data from the database. We can test the web service by running it. Now you know that the web service works now we can finish de midlet application. In this case I want a search/parameter form and where the result are displayed in a tablelayout then I can pick a record to see it in a form layout. For this I use J2ME Business Pack. which is a great framework that really works goed. Let's run the client application from eclipse which can emulate your mobile phone. A new feature in 11g is xml menu where you can define your own menu in xml and then adf can generate the menus with breadcrumb. You only have to make a menu xml and put in some navigation panes in the jsf template. You can have different types of menu on every level of the menu. On the left you see the main and level 1 menus are tabs and level 2 are lists. Under the list menu you see the breadcrumbs. On the right there is a different menu type, level 1 and 2 menu are a bar menu. 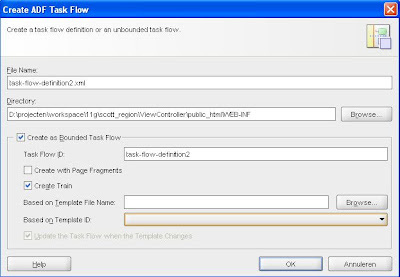 It is very easy to make a xml menu is you already use adf taskflow. On the picture below you see several views. If you click on the diagram and use your right button you can create adf menu. Now we change the menu xml into a menu with different levels, group and a shared menu. A group item is not a jsf page it immediate redirects to a sub item when you click on it. 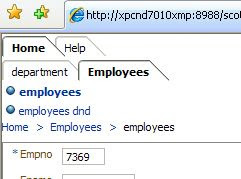 A shared menu is a reference to an another menu xml which is loaded in this menu. If you want to make a sharednode then you only have to copy the bean config and the menu xml . In Jdeveloper 11g you can make a train of actions ( a kind of wizard to help the user ) . 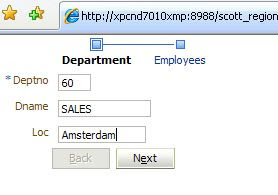 In this example I make a train where I create a department on the first page and then some employees on the second page. See the pictures below. A train is a bounded taskflow ( it has a start and finish point ) where you can define that is has it's own transaction etc. Here we can make one or more employees and if we are finished we push on submit or cancel. one from employees to cancel. create the department page from the train task flow and put in a department from with train navigation and train button bar. 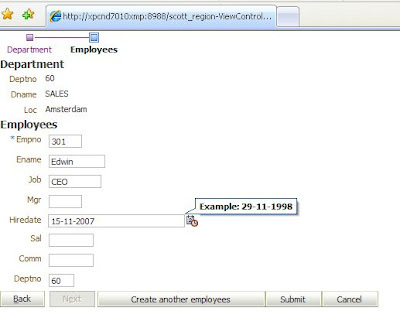 create the employee page from the train task flow with a department form on the top of the page and a employees creation form. We put in a train navigation and a train button bar and a button with submit as text and submit in the action property and a cancel button with action cancel. We are ready to give it a try. If you work on jdeveloper project in teams then you probably experienced that someone checked in bad code or not all the code so the next day nobody can compile the project. Then it is necessary to have a continious build tool and it also does unit tests on the code so you can pro-active react. These build are all open source so it can't be the money if you don't use it in your projects. The first step to have a maven repository. This stores the javax and oracle jars which are needed for compilation, You have to upload the needed jars into the repos. the others non commercial jars are downloaded automaticaly from public repositories and stored in the local repos. For a good description how to setup a repository see this guide on the theserverside. I use artifactory. If you work in teams I think you already have subversion or cvs. This is necessary so maven can check out the code every X minutes for a complete rebuild. Now we are ready to setup a jdeveloper project . Maven needs a typical structure for a normal project and a webapp project. see the picture below. So you need to change the jdeveloper projects to this directory structure. Let's make a trunc folder with a model and viewcontroller subfolders. In the model we have a src folder with two subfolder main and test. In main\java you put in your java and xml's and in test your unit tests. 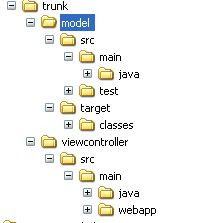 The viewcontroller structure is a bit different you have here a webapp folder in src/main. Here you see we have two projects model and view controller and one shared jar. Here you have extra configuration elements for the issue management , in this case I use jira . If the build fails it makes a issue to the developer in jira . The second is subversion scm connection to check out the model code. The third is the continuum configuration who is has to email if there are changes in the build proces. The build configuration is very import for adf bc ( bc4j) projects because the xml files are very important. Now we can build the application in maven. the last step is installing continuum where we can load the main pom.xml and we now can configure when and how often it has to build .We also get a total overview about over build projects.